WWII STYLE Stainless Steel Canteen Cup with Foldable Handle and Vented LID Brand New Matte Finish. for 1qt. Style Canteens. With STAINLESS STEEL CANTEEN CUP STOVE FOLDABLE. WWII STYLE Stainless Steel Canteen Cup with Foldable Handle and Vented LID Brand New Matte Finish. for 1qt. Style Canteens. 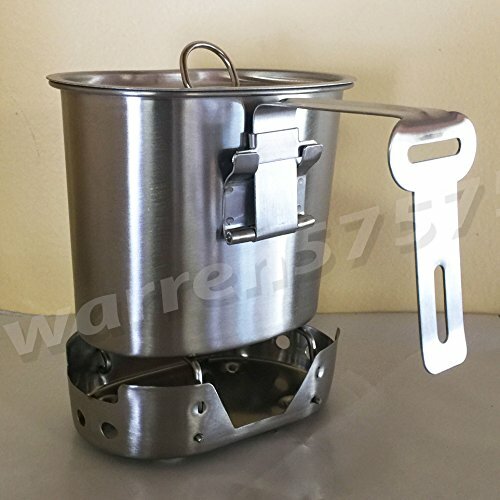 With STAINLESS STEEL CANTEEN CUP STOVE FOLDABLE. by G.A.K at Kerinci. MPN: 900. Hurry! Limited time offer. Offer valid only while supplies last. WWII STYLE STAINLESS STEEL CANTEEN CUP BRAND NEW WITH VERTICALLY FOLDABLE HANDLE AND NEW STAINLESS STEEL VENTED LID IMPORTED, BRUSHED MATTE FINISH. WWII STYLE STAINLESS STEEL CANTEEN CUP BRAND NEW WITH VERTICALLY FOLDABLE HANDLE AND NEW STAINLESS STEEL VENTED LID IMPORTED, BRUSHED MATTE FINISH. WITH NEW STAINLESS STEEL CUP STOVE Compact lightweight cook stove will burn trioxane, hexamine or good old Sterno fuel. Raised feet, Side slot vents and fold-down pot supports make this convenient backpackers, hikers, campers stove that's easy to transport. Measures 4 ½"L X3"W X11/8" H when folded. PLEASE BE ADVISED THAT THE CANTEEN CUPS DO NOT FIT WITH ALL STANDARED GI CANTEENS. G.I. Style Stainless Steel 1qt. Canteen with Cup and Military Outdoor Clothing Never Issued Safariland SPEAR MultiUse1 Qt Canteen Pouch. WWII STYLE Stainless Steel Canteen Cup With Vented LID for 1 QT. Canteen. G.I. Style Stainless Steel 1qt. Canteen/cup. With Used Surplus G.I. Issue Olive Drab Nylon Canteen Cover. G.I. Style Stainless Steel Canteen Cup 700ML with Lid & STAINLESS STEEL STOVE/Stand FOLDABLE Set.